MW500 ORP Meter – Range ± 999 mV, Accuracy of ± 5 Mv. Supplied with a MA921B/1 Platinum Electrode amd 1 X 9V Battery. *Important Note: The SM500 & SM100 are discontinued and replaced with the new MW500 amp; MW100. The new "MW" product group all have these new or improved features: Faster Processor with the new chipset amp; motherboard. Smaller, ergonomic amp; lighter case design. 100% larger amp; easier to read LED display. Easier amp; faster to calibrate. Longer battery life. Note: Shipping available for the USA and Canada only. 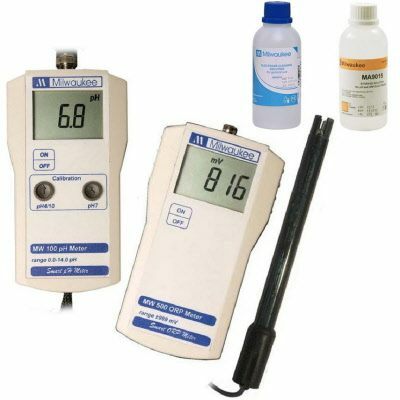 MW102 portable pH/°C meter, w/ probes, ±0.02 pH ACCURACY.